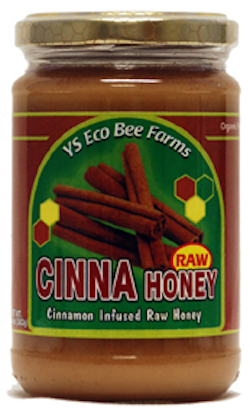 Cinna Honey is a delicious whole food blend of cinnamon and raw wildflower honey. Cinnamon is one of the oldest known spices and recent studies have shown it to have many beneficial properties. This raw honey is 100% pure, natural, unpasteurized and unfiltered, fresh from thriving beehives. This true raw honey provides highest levels of live enzymes, vitamins, minerals and antioxidants as a functional whole food. Enjoy the delightful taste of Cinna Honey on sourdough bread, bagels, biscuits or in your favorite cup of tea! !